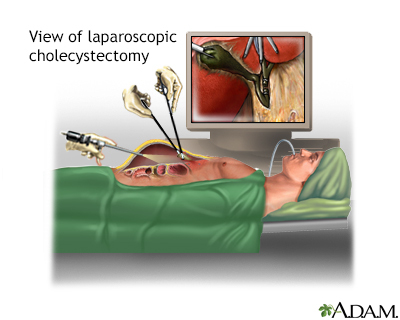 Surgery using a laparoscope is the most common way to remove the gallbladder. A laparoscope is a thin, lighted tube that lets the doctor see inside your belly. 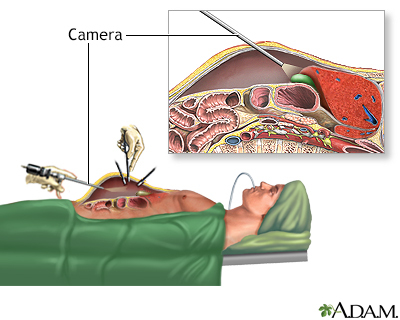 Gallbladder removal surgery is done while you are under general anesthesia so you will be asleep and pain-free. 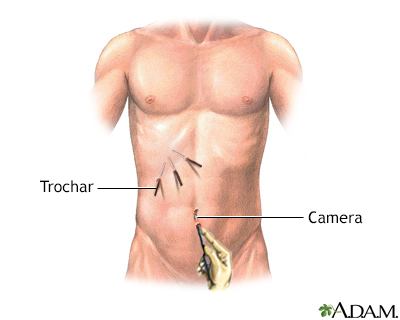 The gallbladder is then removed using the laparoscope and other instruments. To do this test, dye is injected into your common bile duct and an x-ray picture is taken. The dye helps find stones that may be outside your gallbladder. You may be asked to stop taking aspirin, ibuprofen (Advil, Motrin), vitamin E, warfarin (Coumadin), and any other drugs that put you at higher risk of bleeding during surgery. If you do not have any problems, you will be able to go home when you are able to drink liquids easily and your pain can be treated with pain pills. Most people go home on the same day or the day after this surgery. If there were problems during surgery, or if you have bleeding, a lot of pain, or a fever, you may need to stay in the hospital longer. 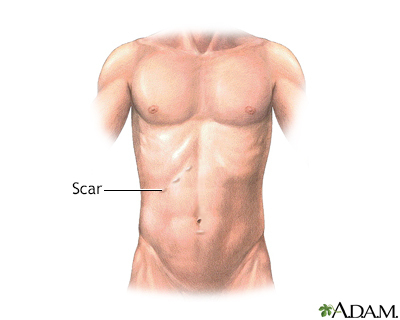 The gallbladder is a sac located under the liver. It stores and concentrates the bile produced in the liver. Bile is released from the gallbladder in response to food, especially fats, in the upper small intestine. The gallbladder is a sac located under the liver. It stores and concentrates the bile produced in the liver.